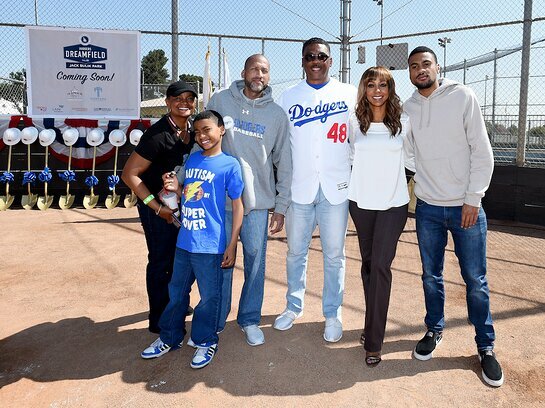 The Los Angeles Dodgers Foundation (LADF), in partnership with the Cal Ripken, Sr. Foundation and the City of Fontana Community Services Department broke ground on an all-new Universally Accessible Dodgers Dreamfield at Jack Bulik Park in the City of Fontana on World Autism Awareness Day, Tuesday, April 2, 2019. This field will be LADF’s second Universally Accessible field designed for youth with special needs and physical disabilities, and its 51st Dodgers Dreamfield expected to be complete in June. The construction of this $600,000 project is also partially funded by Easterseals Southern California, LA84 Foundation, San Manuel Band of Mission Indians and Security Benefit. There are 30,000 children living in the neighborhood surrounding Jack Bulik Park and 3,000 with special needs. This field is designed to accommodate these youth participating in local leagues like the Little League Challengers Division. Amenities will include rubberized surfacing, enlarged dugouts with rooftops, backstops, player benches, bat racks, vinyl coated chain link fencing and gates, bleachers, LED solar scoreboard with signage that resembles Dodger Stadium, and concrete paving. Since 2003, over $10 million has been invested in 50 fields, providing access to over 300,000 youth in and around Los Angeles. In 2018, the foundation revealed that it is extending its initial commitment of 50 fields with an additional $10 million to build 75 fields by the 75th anniversary of the Dodgers’ relocation to Los Angeles. Dreamfield 51 marks the first step on the road to 75 fields. Through the Dodgers Dreamfields program, LADF builds and refurbishes baseball and softball fields in underserved communities to provide a safe place for youth to conduct positive recreational activity in their own neighborhoods. In partnership with corporations, foundations and local municipalities, Dodgers Dreamfields contribute to both community development and youth development by providing youth the opportunity and space to learn and play the game of baseball and softball while building character and instilling important life lessons.